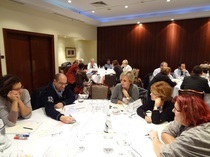 A lively two-day debate at the Cedefop conference on the shift to learning outcomes and its impact (21 and 22 November 2013, Thessaloniki) concluded that learning outcomes are here to stay but there is still a lot of work to be done. Opening the conference, Cedefop Director James Calleja told 140 participants from 27 countries that ‘learning outcomes raise the employability profile of qualifications’. He talked about ‘an issue of paramount importance’ to European vocational education and training (VET) and lifelong learning developments, and added that ‘the challenge for all of us is to converge diverging approaches in writing learning outcomes’. ‘Working on qualifications and learning outcomes has been one of Cedefop’s key activities’, noted Mr Calleja. In her keynote speech, Cedefop’s Head of Area Enhanced Cooperation in VET and Lifelong Learning, Mara Brugia, said that ‘the learning outcomes principle can be seen as the “glue” binding together a wide range of European initiatives taken during recent years’. She stressed that ‘Europass, the EQF, ECVET and ESCO, to name but a few, not only build on this principle, but are active promoters of it’. Ms Brugia said that ‘learning outcomes have moved to the centre stage of education and training policies in a way we had not seen before’. She argued that the increased focus on learning outcomes in the policy agenda ‘is linked to the need for a better connection between education and training and employment’. The development of national qualifications frameworks (NQFs) has been the most visible expression of the shift to learning outcomes, Ms Brugia believes. ‘NQFs have supported the implementation of learning outcomes in areas they hadn't been applied before’, she added. According to Ms Brugia, ‘our main challenge lies in transforming expected outcomes into actual outcomes, i.e. into knowledge, skills and competences delivered by schools and held by learners. The way we monitor and review this transformation is critical and has not been sufficiently addressed in European debates so far’. She proposes considering two key issues to address this challenge: the relationship between education and training and the labour market, and the link between quality assurance and learning outcomes. Three workshops on the first day of the conference came up with several suggestions on these issues, summarised by Jean Gordon, Director of the European Institute of Education and Social Policy. Suggestions included: putting learners at the centre of processes; more active involvement of all groups of stakeholders; promoting common understanding and language across subsectors of education and training; more support for teachers/trainers across Europe; and stronger links between learning outcomes, governance and quality assurance. At the discussion panels diverse opinions were expressed. University of Bremen’s Georg Spottl said that the learning outcomes discussion must have ‘a human-orientated and not economic approach’. Austria’s Lorenz Lassnigg argued that the only way to make learning outcomes work is to shift them from the political to the pedagogical level. European Commission’s Ana Carla Pereira emphasised that the learning outcomes debate is ‘unknown to those outside education and training’. The Commission, she added, is about to launch a consultation on skills and qualifications to promote the debate and break boundaries. Eduard Staudecker, of Austria’s Federal Ministry of Education, stressed the ‘need to bring teachers to the new concept because it affects their autonomy’ and added that companies have been left out of the learning outcomes discussion. In his closing remarks, Cedefop Deputy Director Christian Lettmayr pointed out that the learning outcomes concept is deeply human and deeply individual but also complex, requiring a change of culture. ‘There is a long road ahead’, he concluded.